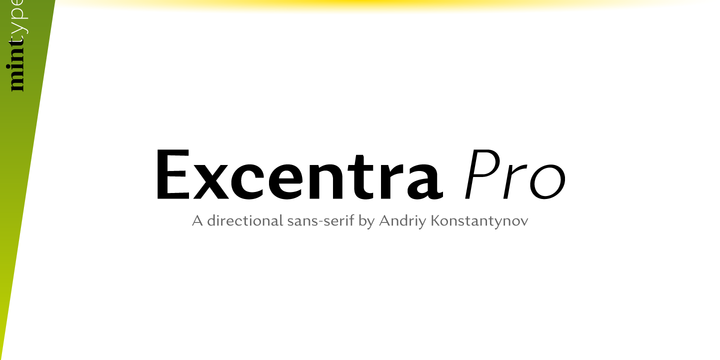 Excentra Pro is a sans serif typeface created by Andriy Kostantynos and published by Mint Type which was inspired by the typefaces of 1920’s. Available in 8 weights (from ULight to XBold) with corresponding italics, a wide range of OpenType features and multilingual support, is characterized by humanistic stroke variation with inclined axis. It is ideal for branding, editorial use, logo, magazine, text and so on. Have fun! Price: starting from $30,00 for one font to $280,00 for all 16 fonts. A font description published on Monday, October 23rd, 2017 in Andriy Kostantynov, Fonts, Mint Type by Alexandra that has 1,940 views.